description for "Winter Squash and Pumpkins: Cucurbita pepo, 'Rouge Vif d'Etampes'"
Cucurbita pepo 'Rouge Vif d'Etampes' is a Cinderella-type pumpkin grown for over one hundred years for its rich orange color and distinctive ribbing. 'Rouge Vif d'Etampes' fruits have few seeds and vary in size from 5-40 lbs. More for decoration than eating. Planting depth: .5-1 inch. Days to germination: 5-7 days. 130-160 days to maturity. 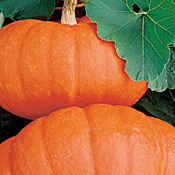 reviews for "Winter Squash and Pumpkins: Cucurbita pepo, 'Rouge Vif d'Etampes'"